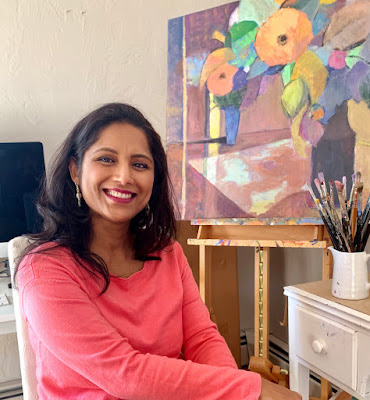 Garima is a fine artist from the Boston area who creates landscapes, still life and floral paintings that have a certain joyful emotion in them. She draws her sense of color from many places including her native country India and USA, her home since 1999. In 2011, she left a successful career in the IT industry to pursue her passion for art. Oil is her medium of choice. The artist paints full time in her home studio in Andover, MA. Creating art that has great color, depth and mood are my key objectives. I use a combination approach from wet-on-wet to layered to scraping using both brush and palette knife. In my recent work, I am attempting to use shapes of color, transparency, and layers to create an interesting surface and design.